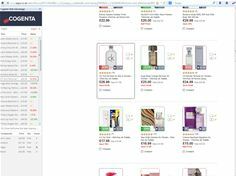 Leading retail intelligence technology group Cogenta (www.cogenta.com) has launched Web Advantage, an innovative new tool, which for the first time, enables retailers, manufacturers and brand managers to compare real-time pricing across multiple product categories. Developed in response to client demand, Web Advantage provides highly accurate up to the minute price intelligence data and competitive price tracking from consumer good sites across the web. This enables the system’s users to compare and analyse their own price-points and stock holdings with those of their competitors or channel partners (as in the case of manufacturers). Users can then exploit the highly lucrative opportunities available from adjusting their prices ahead of the pricing positions held by their key market competitors. The intuitive plug-in system is designed to be compatible with existing working practices and is based on Cogenta’s acclaimed real-time pricing analysis engine which monitors over 15 million products a day. Adrian Hobbs the CEO of Cogenta felt that the new product will enable retailers and manufacturers to reach new levels of competitive price management. In his view; “We’ve involved our customers in the development of Web Advantage and the new tool closely reflects their input and wish lists. Cogenta is the pioneer and the market leader in the provision of retail and pricing intelligence to UK’s top and most trusted high street and online retailers. Its competitive intelligence service (NetPrice) equips UK’s operating retailers with the business intelligence to help them to optimise stock and pricing decisions and therein maximize profits every day. Cogenta provides unrivalled level of data accuracy and tracks price, stock, delivery information and promotional activity surrounding retail products in a wide range of categories. They also publish consumer shopping applications that help consumers to make the best pricing decisions. Cogenta tracks consumer shopping behaviour and enables brands and retailers to communicate and target new audiences via mobile.